The SBS student mentorship program focuses on guiding freshman and sophomores as they take their first steps in the baccalaureate program at FCC. 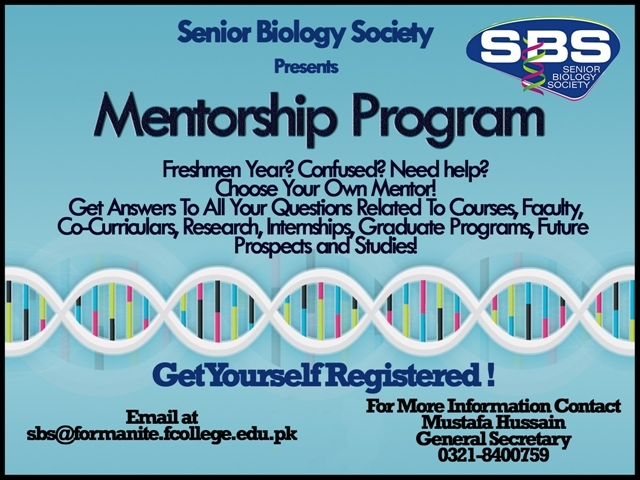 It is run by students and is targeted towards students majoring in biotechnology or the biological sciences. The initiative stems from the problems faced by students initially regarding course selection, major declaration, and general education. The mentors of this program have also experienced the same problems in their time, therefore they can understand them better and provide better solutions to eradicate them. Mentor profiles are also available on the below link. Please click here to register for this mentorship program.